It’s been quite a tumultuous couple days for Vols fans. Find out here what all you may have missed through the confusion, and what the future looks like now. It had been official for a couple weeks now that Tennessee AD Phillip Fulmer has been searching for a replacement after letting Holly Warlick go. 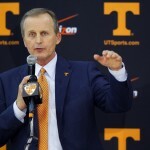 Much to his and Vol Nation’s concern however, reports came in late Sunday night that claimed Rick Barnes had been offered a large contract by the UCLA Bruins, a program that established itself as a Blue Blood back in Barnes’ day. Fulmer, a football-oriented kind of AD, was facing losing the coach that had his basketball program somewhere it had never been, and making two hires in a sport he wasn’t all too familiar with. Over the 24 hours or so after news broke from the West Coast, it was reported by Chris Low that UCLA had offered a $5 million annual salary on top of paying the same amount in buyout, but Tennessee had counter-offered, forcing Barnes to make a decision while the restaurants of Knoxville courted him with free food. He prayed on it, and made his decision late Monday night to stay with the Volunteers, per Chris Low. Details on his new contract with UT have yet to be officially announced. Barnes is 88-50 over is tenure at Tennessee, but over the last two seasons he has gone 57-15, won a share of the 2017-18 SEC title, made it to the SEC Tournament Final in back-to-back seasons, earned a 3 and a 2 seed, and made it to the Sweet Sixteen. He has also won the SEC Coach of the Year in back to back seasons, as well as the Henry Iba award and the Naismith Coach of the Year. Barnes turns 65 in July. While rumors were flying across the Twitter-sphere all day Monday, some Lady Vol coaching rumors snuck into the mix. 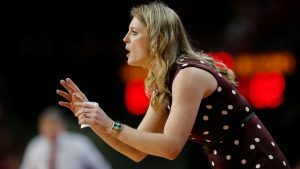 It was being reported initially by Fox Sports Knoxville, and has now been confirmed by Chris Low of ESPN, that former Lady Vol player and Missouri State head coach Kellie Harper would be announced as the replacement for Holly Warlick as the coach of the Lady Vols. Harper played on three straight national championship squads under Pat Summit from 1996-1998. She has gone 285-208 as a head coach, coaching at Western Carolina, Louisville, and Missouri State. She accumulated records of 97-65, 70-64, and 118-79 at those three stops respectively. Kellie was the SoCon Coach of the Year in 2007 after winning the conference regular season title, and has also won 4 conference tournaments, 2 in the SoCon and 2 in the MVC. Harper just won the 2019 MVC Coach of the Year as well as the Kay Wow Coach of the Year award after leading Missouri State to the Sweet Sixteen. She has made the NCAA Tournament a total of 5 times, and only broke through the First Round this past season. No contract details have been released, and the story will be updated as news is released.